I’ve written about Sega/Mega CD before, but only recently have I been playing it a whole lot. 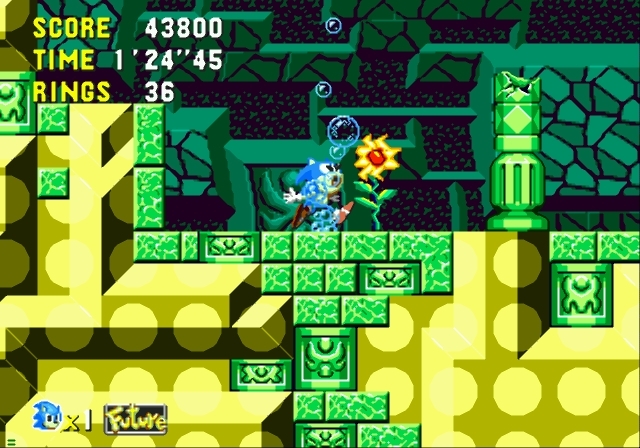 One of the well-known gems of its library was the highly-regarded Sonic CD. It was released soon after Sonic the Hedgehog 2 for the Genesis, but had a different game design team. 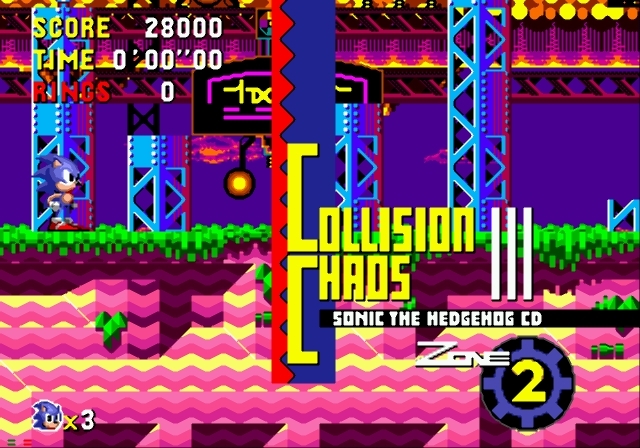 The same group that worked on the original Sonic the Hedgehog (from the old Sega Genesis/Megadrive pack-in) worked on Sonic CD, whereas a different team went on to do Sonic 2 and 3 and Sonic & Knuckles. Or something like that. 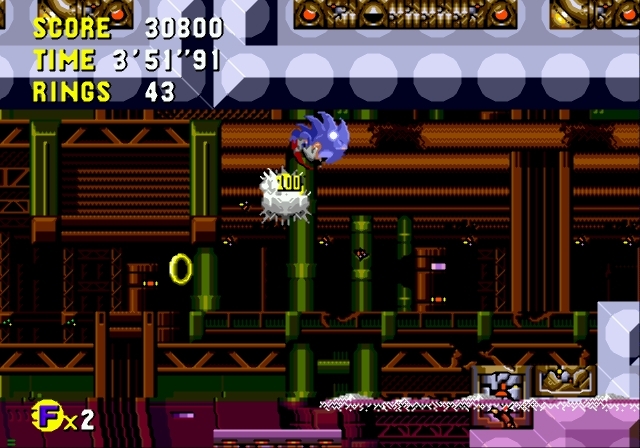 It’s very apparent from the start that the gameplay and graphics to Sonic CD share many more characteristics of the original Sonic game than Sonic 2. I am only discovering now the exceptional quality of some of the tunes on Sega CD. I didn’t own it when I was a kid. It’s too bad the system didn’t have more badass games that could take advantage of the superb sound options. Some of this stuff just straight up moon-rocks. A lot of the sounds are classic club/studio samples from the early ’90s, which is A-OK by me! I’m talking early ’90s European MTV dance music keyboard patches: Ace of Base, Blackbox, Marky Mark and the Funky Bunch. But don’t read it the wrong way, this game music is actually much better than those bands. Sort of the way Yuzo Koshiro totally snagged musical influence/ambiance from Blackbox to compose Streets of Rage 2, in the process making Blackbox’s style sound really good. What I find really amusing is how the Sonic CD soundtrack reminds me of a cross between the soundtrack to The Real Ghostbusters (maybe the best cartoon history will ever know, with music by a project called Tahiti), and the tunes featured in early ’90s PBS kids shows like Ghost Writer. Come to think of it, can you imagine how awesome it would have been to do a cross-over where the Ghostbusters had to bust Ghost Writer? I can’t believe I share ideas this good! On top of all this, the music here provides a preview of what direction the composition in the series was headed for with the later Dreamcast titles. 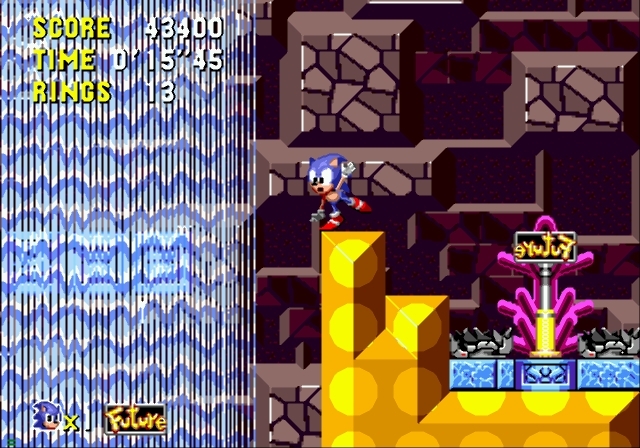 The epic, endearing power-pop metal of Sonic Adventure has its roots here, but Sonic CD has more relaxed vibes for its main themes, using keyboard patches that reflect the time period. 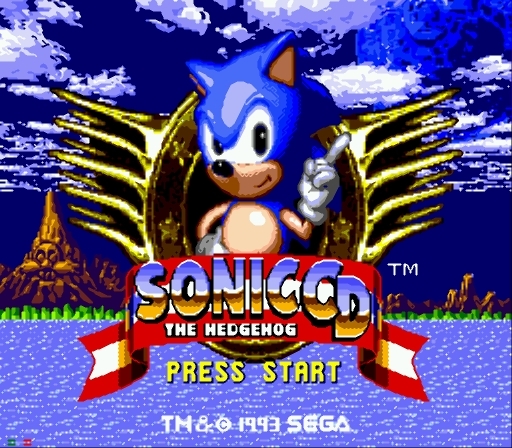 While the Sonic Adventure soundtrack was something of a retro-throwback to the best the ’80s guitar-rock genres had to offer, Sonic CD came out in the the early ’90s, when pop music was leading into a different kind of studio production and placed less emphasis on promoting hair-metal. So it’s rather interesting to me to compare the two soundtracks and see which one is favorable. They’re both very strong works, though I think Sonic Adventure has one of the better modern (CD-based audio quality) video game soundtracks to date. That being said, the Sonic CD music is unique to the Sonic series, as it has a rather melancholic, dream-like quality to it. It’s very inspiring, but also very interesting for the way it colors the game. It’s not what one would imagine of a Sonic game. I really do like the use of the choir singers (again, with the reference to the Ghostwriting music and whatnot) and the droning synths and echoing guitars. My only complaint would be that some of the tracks sound too similar. But honestly, I’m pretty impressed by what I’ve heard. 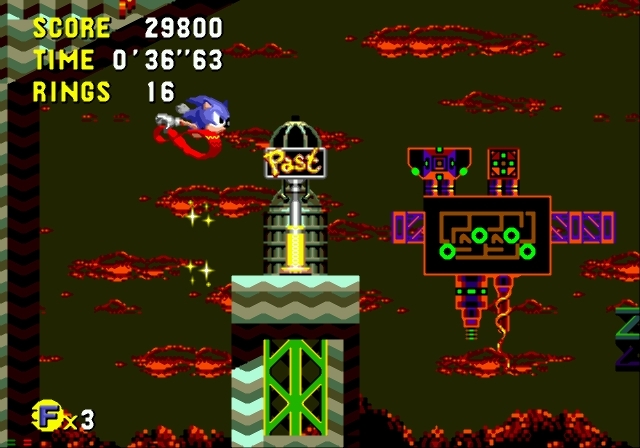 These early Sonic games could actually compete with Mario as flagship console platformers. Hence it’s unfortunate that with Sonic Adventure the competition ended. Perhaps it was a sign of things to come. Don’t get me wrong; Sonic Adventure was a decent game. But it had some bugs and the action was not nearly on the same level as Super Mario 64 or Mario Sunshine. Sonic Adventure felt like a really fast, action-packed movie experience. You know how movie critics always say action movies are high-octane? Well, Sonic Adventure was like that: high-octane. But being high-octane isn’t, like, everything in games, dontcha know. *Sewer Shark was the Sega CD pack-in and it was amazingly terrible. You really have no idea. I’m talking like, Back to the Future video-game terrible. ~ by chaosrexmachinae on November 13, 2007. Nice! I am totally going to try and locate those discs. That info on Ecco the Dolphin CD is spruce as well. I never played the CD versions, but now I’m pretty curious about them. Thanks for the heads up, Rob! By the way, some of the tracks on your music page are pretty not-too-shabby. And I agree…Vangelis is awesome. Thanks for the compliment! E-mail me and I can point you to a site to find some of the music. Sonic CD has amazing music. The American version is superior! The only good track on the JPN release is the present Tidal Tempest track, which is awesome. I play my Sonic CD and Ecco 2 discs all the time. The music is my Spencer Nilsen, look him up!